Revenge of the Fans has exclusively reported that DC Entertainment is working on a new animated film based on Batman: The Long Halloween. The film will be in two parts. 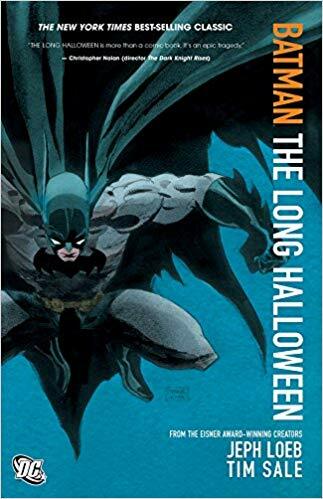 Batman: The Long Halloween was published by DC comics and spanned thirteen issues. It is one of the most popular among DC fans. Revenge of the Fans reports that Troy Baker (who has voiced Batman and the Joker previously), Jensen Ackles (who has voiced Jason Todd), Naya Rivera, Titus Welliver, and David Dasmalchian, among others will be part the cast, though it is currently unknown who they will be portraying. Other cast members include Jim Pirri, Amy Landeck, Matthew Gray Gubler, Katee Sackhoff and Gred Tatasciore. There is no word yet on an official announcement or release date from DC. You can read the complete report from Revenge of the Fans here.